Impact Resistant, Durable and Robust Casing. All units are powered by the mighty GENESIS VRLA battery. An Optimum Jump Start Package for a fanstastic Price. -Superior quality components guaranteed reliable and high levels of safety. -Used extensively in the car and commercial sectors, the armed and police forces. -Fully isolated clamp and copper cables (super flexible). 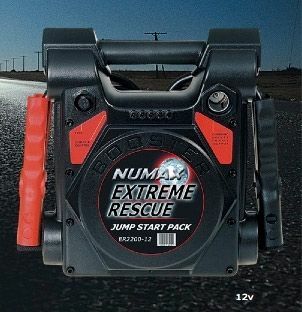 -All jump starter packs are fitted with a socket which provides a portable power source for all 12v dc accessories equipped with a male cigar lighter plug. -During automobile battery replacement, radio and phone memory codes can be saved by connecting the starter to the cigar lighter outlet of the vehicle. -Automatic charger with smart circuit which allows the unit to be left in continuous charge without incurring damage.